Unconditional Election is the doctrine which states that God chose those whom he was pleased to bring to a knowledge of himself, not based upon any merit shown by the object of his grace and not based upon his looking forward to discover who would “accept” the offer of the gospel. God has elected, based solely upon the counsel of his own will, some for glory and others for damnation (Romans 9:15,21). He has done this act before the foundations of the world (Ephesians 1:4-8). This doctrine does not rule out, however, man’s responsibility to believe in the redeeming work of God the Son (John 3:16-18). Scripture presents a tension between God’s sovereignty in salvation, and man’s responsibility to believe which it does not try to resolve. Both are true — to deny man’s responsibility is to affirm an unbiblical hyper-calvinism; to deny God’s sovereignty is to affirm an unbiblical Arminianism. The elect are saved unto good works (Ephesians 2:10). Thus, though good works will never bridge the gulf between man and God that was formed in the Fall, good works are a result of God’s saving grace. This is what Peter means when he admonishes the Christian reader to make his “calling” and “election” sure (2 Peter 1:10). Bearing the fruit of good works is an indication that God has sown seeds of grace in fertile soil. This author agrees with Election but not Unconditional Election. There certainly is a condition and only one condition which is faith in Jesus Christ (Joh 3:16; Rom 10:9, 10; Gal 2:16; Phil 3:9). The Arminian stance is that God foresaw who would choose Him and those are the elect He is speaking of in the Bible. This author can not agree with such a stance because there is no Biblical basis proving it. Calvinism says that God picked specific people who would become saved before the foundation of the world and the rest were destined for the Lake of Fire (reprobation). That is completely false. Neither of these stances explains fully who and what the election is according to the Bible. If you are not acquainted with the doctrine of Unconditional Election, the first paragraph from the Calvinism web site above starts to describe it somewhat but the full implication of what they are saying is not evident. The problem with the Calvinist stance is that the people who are to be saved had no choice in their salvation because they do not have a free will (Total Depravity), which this author has already proven false. However, a worse problem with the Calvinist stance is the belief that God did not try to save all men and that He sends people to Hell without giving them a chance at salvation. This author has a major problem with that belief. Infants and Children Go Straight to Hell? Gen 8:21 And the LORD smelled a sweet savor; and the LORD said in his heart, I will not again curse the ground any more for man’s sake; for the imagination of man’s heart is evil from his youth ; neither will I again smite any more every thing living, as I have done. Psa 51:5 Behold, I was shapen in iniquity; and in sin did my mother conceive me . Pro 22:15 Foolishness is bound in the heart of a child ; but the rod of correction shall drive it far from him. Make no mistake about it, man is born with a sinful nature in his flesh. Man from his mother’s womb is sinful. That includes all infants and children. Being born human means being born with a curse of sinfulness in our flesh. On these verses alone, it would seem that all infants and children are bound for Hell. But thank God the Bible says more than this. All humanity, other than the Jews, will be tried by the Law of Conscience. This is a type of law that is put into the mind of all mankind. The conscience tells us when we do wrong according to the standards that were placed there by our parents/guardians, society, and our spirits. So what about infants and children? The answer is similar to the laws of men: if a small child kills someone, they are not tried and sentenced to be killed by lethal injection. No, it is considered an accident because they did not understand. If man has the common sense to see this, how much more would God? Calvinism does not agree with such logic because of the wrong premise of Unconditional Election which says that God sends the innocent to Hell. Infants and children are certainly innocent because they do not truly understand the law. Infants and children are in the process of growth physically, mentally, and spiritually. Nothing in them is fully developed including their minds which holds the Law of Conscience. A child’s understanding is limited so that if they sin, it is not counted against them such as when an adult does wrong. When an adult transgresses the Law of the Conscience they are found guilty and are sentenced to death. Paul clearly says he was alive spiritually once when there was no law for him. Did we not just read all of those verses saying man is born sinful from his youth? How can we be born in sinfulness and yet be alive spiritually? Both are true. Man is born sinful which means he has a sin- nature in his flesh but as an infant and child his spirit and soul are still alive unto God. Sin has no power over the child until the law comes; the law makes him aware of the sins he committed because his conscience is not fully developed as a child. Therefore, if he dies as an infant or child, he most certainly will go to Heaven. The first moment a person understands his transgression of the law and sinfulness, is the moment they die spiritually or are separated from God. This is called the age of accountability by most teachers. It is different for everyone but it seems to happen for most people in the early teens. Possibly there is some relation to when teens become so rebellious and the moment of separation from God. Rev 3:5 He that overcometh, the same shall be clothed in white raiment; and I will not blot out his name out of the book of life , but I will confess his name before my Father, and before his angels. It is safe to conclude that ALL men were written in the Book of Life from the beginning of time. If they die stillborn, or in infancy, or as children, they remain in the Book of Life and go to Heaven. ALL were originally elected to go to Heaven. Only the devil and his angels were destined to go to Hell (Matt 25:41). However, men make the choice to reject God, Jesus, and His plan of salvation therefore they go to Hell but it is not God’s will that any man go to there, no not one (John 3:16; 1 Tim 2:4; 2 Pet 3:9). God elected that all men be saved. The Bible is extremely clear on this point. Joh 3:16, 17 For God so loved the world , that he gave his only begotten Son, that whosoever believeth in him should not perish, but have everlasting life. For God sent not his Son into the world to condemn the world; but that the world through him might be saved. 1Ti 2:3, 4 For this is good and acceptable in the sight of God our Savior; Who will have all men to be saved, and to come unto the knowledge of the truth. 2Pe 3:9 The Lord is not slack concerning his promise, as some men count slackness; but is longsuffering to us-ward, not willing that any should perish, but that all should come to repentance . Joh 12:32 And I, if I be lifted up from the earth, will draw all men unto me . Because of the above Scriptures, this author breaks election down into two parts: 1) God’s original election was that ALL MEN BE SAVED and 2) God permits men to reject His plan of salvation so some will not be saved and others will. Part of God’s plan of election was that all men be saved. This is His perfect will. Of course, all men are not going to be saved because many have made the choice to reject Him. That leads to the other part of God’s plan of election called His permissive will. All men and events concerning men in the earth follow either God’s perfect will or His permissive will. Generally speaking, all men are the elect but specifically speaking, only those that accept the Gospel are the elect. For all practical purposes Arminianism is correct by saying that the elect are those that God foresaw would choose Him but the Bible emphasized the fact that God intended to save all. Therefore, an expansion of the traditional idea of election is needed which is shown by the remaining statements of this article. If it is God’s perfect will that all men be saved, then why are they not all saved? Something must prevent their salvation but what is it? Simple: Man has a free-will to reject the Gospel. God does not reject some men and accept others. God is the One that says, “ Behold, I stand at the door, and knock: if any man hear my voice, and open the door , I will come in to him, and will sup with him, and he with me (Rev 3:20).” It is our choice. Let us start with who are the elect of the Bible? Calvinism says the elect are those chosen by God ahead of time for salvation. This author’s definition of elect is: the person or people group that God is referring to in that particular passage of the Bible under a specific plan as opposed to a different person or people group that are under a different plan. Every time the word “elect” is mentioned, it could be talking about a number of different people groups and different plans or dispensations that they are under. One must read that passage of the Bible in context to figure out which person or people group God is talking about and which plan that they are under. The term “elect” is not used equally throughout the Bible. It is a generic term used in many different ways for different people in different passages. Isa 42:1 Behold my servant, whom I uphold; mine elect , in whom my soul delighteth; I have put my spirit upon him: he shall bring forth judgment to the Gentiles. Jesus, the Messiah, is called an elect. Isa 45:4 For Jacob my servant’s sake, and Israel mine elect , I have even called thee by thy name: I have surnamed thee, though thou hast not known me. The Church is called elect. 1Ti 5:21 I charge thee before God, and the Lord Jesus Christ, and the elect angels , that thou observe these things without preferring one before another, doing nothing by partiality. (1.) of the election of individuals to office or to honour and privilege, e.g., Abraham, Jacob, Saul, David, Solomon, were all chosen by God for the positions they held; so also were the apostles. (2.) There is also an election of nations to special privileges, e.g., the Hebrews ( Deu_7:6 ; Rom_9:4 ). (3.) But in addition there is an election of individuals to eternal life ( 2Th_2:13 ; Eph_1:4 ; 1Pe_1:2 ; Joh_13:18 ). Men are elected “to salvation,” “to the adoption of sons,” “to be holy and without blame before him in love” ( 2Th_2:13 ; Gal_4:4 , Gal_4:5 ; Eph_1:4 ). Calvinism stands on a passage in Romans 9 to prove that God has elected some to salvation and others to condemnation. It is true that God will save those that accept Him and condemn those that reject Him. However, to say God chose some men to go to Hell without the chance of salvation is completely false. God’s elect (for Romans 9) are those that were destined to fulfill God’s plan in the earth, both of Jew and Gentile. God has an election of salvation for each person born but not all choose to fulfill that call. But even if we reject God, He has a plan and uses us for His glory. God’s perfect will was that the Jews all be saved. God’s permissive will is what ended up happening, which is that the Jews rejected Jesus, but both plans were included in God’s plan called “election”. So everyone is God’s elect (in this passage) but the difference is that some have chosen not to obey that call. They have followed God’s permissive will instead of His perfect will. Rom 9:12 – 14 It was said unto her, The elder shall serve the younger. As it is written, Jacob have I loved, but Esau have I hated. What shall we say then? Is there unrighteousness with God? God forbid. People have misinterpreted Romans 9 to say that God chose Esau to be hated and Jacob to be loved. So they conclude it means God hates some people and has appointed them to Hell while others He loves and has elected/predestined only them to be saved. They totally misunderstand that this Scripture is talking figuratively about the flesh verses the spirit. God has appointed the flesh to destruction and the spirit to life, not some people are appointed to wrath and others are not. This context is easy to see going back to verse 8, “ They which are the children of the flesh, these are not the children of God: but the children of the promise are counted for the seed .” THIS is the thing that Calvinism misses: God has appointed the way of the flesh to destruction represented by Esau – not certain men. God has predestined the spirit of all men to be saved represented by Jacob. But only those men that choose the way of the Spirit will be saved. Rom 9:15, 16 For he saith to Moses, I will have mercy on whom I will have mercy, and I will have compassion on whom I will have compassion. So then it is not of him that willeth, nor of him that runneth, but of God that showeth mercy. When it says that “He hardeneth”, do not take that to mean God actively made pharaoh hardened against Him. God does not make men do evil He only allows them to be rebellious. So, again, here we see God’s permissive will in play. He permitted pharaoh to harden his heart against Him. Why? That He might show his power and that His name is declared throughout all the earth . You see, man was made to glorify God. Whether we choose to obey Him or not, God still will get the glory; this is what the plan of election is all about. His perfect will is that we all obey but God is not a fool. He knows man will not obey so He also has a permissive will or plan that accounts for man’s rebellion. Rom 9:18 – 21 Therefore hath he mercy on whom he will have mercy, and whom he will he hardeneth. Thou wilt say then unto me, Why doth he yet find fault? For who hath resisted his will? Nay but, O man, who art thou that repliest against God? Shall the thing formed say to him that formed it, Why hast thou made me thus? Hath not the potter power over the clay, of the same lump to make one vessel unto honor, and another unto dishonor? God will have mercy on whomever He chooses. We have already proven that His mercy has been granted to all mankind in this age through Jesus Christ. God has afforded to every man a chance at salvation but the choices men make can reject God’s mercy. If men continue to reject the Gospel over, and over, and over, eventually God will leave them to their choice and they will face the penalty of sin which is the second death. Understand our God is extremely merciful. Mercy is one of His defining characteristics. However, the rebellion in man is also very extreme. God knows for many men that no amount of mercy will be enough to turn their heart unto Him. Mercy is a passive action that does not force men to follow Him but gives them time to do so. One definition of mercy could be “time allotted to repent”. In this life, time is limited. Man only has so many years before his spirit leaves his body and he dies. Every moment a sinner is alive is another moment of God’s mercy granted unto him to repent. We readily see from Romans 9 that God does have a plan of election. His plan, as explained taking the whole Bible into context, was to save all mankind through Jesus Christ. The elect in Romans 9 includes all men but more specifically those who accept Him. For those that would not accept God’s plan of salvation there will be condemnation. Rom 8:29, 30 For whom he did foreknow, he also did predestinate to be conformed to the image of his Son, that he might be the firstborn among many brethren. Moreover whom he did predestinate, them he also called: and whom he called, them he also justified: and whom he justified, them he also glorified. To be elect there must be some group from which they were elected signifying that they are different than the original group. What is that original group? All men since Adam and Eve, i.e. all of humanity. The elect or the called is the Church of the Lord Jesus Christ who were predestined from among all men that ever were and are to be created. They are destined to be the Bride of Christ. This solves the mystery of the elect spoken of in the New Testament. They are the men that God knew ahead of time (foreknew) that would be created during this time period of grace (approximately the last 2000 years). Everyone was to be a believer if they accepted the Gospel and were born of the Spirit. Anyone can be a believer if they so choose. One may say, “If all men of this age of grace were the elect then why are not all men glorified? Surely all men since the resurrection of Jesus are not born-again.” Of course, all men since they resurrection are not born-again. Many have rejected the Gospel and will spend eternity away from the presence of God and His holy angels. “Glorified” is a present-tense state for believers. However, the act of glorification took place when Jesus rose from the grave (past-tense). As far as God is concerned, glorification already took place for all believers of the Church past, present, and future. However, the glorification can be rejected by men and thus nullifying its power to regenerate because they have not mixed faith with it (Heb 4:2). Once one becomes a believer, glorification immediately takes place on the experiential level though it really was already done in the past. Understand that these verses are referring only to the Church of the Lord Jesus Christ. We know that because those “conformed to the image of His Son” are the members of the Church. So the Church is called. Are all men destined to be in the Church? All men since the resurrection were destined to be in the Church; these are the elect. Joh 3:16, 17 For God so loved the world, that he gave his only begotten Son, that whosoever believeth in him should not perish, but have everlasting life. For God sent not his Son into the world to condemn the world; but that the world through him might be saved. Are you a “whosoever”? Yes, you are and so is anyone else that hears and believes. Who is God trying to save? Only the special ones He gives the ability to do so? NO, but He is trying to save “the world”. To say otherwise is to discount the awesome love of God and the power of what Jesus did on the cross, not to mention a total disregard for these verses of the Bible. 2Co 5:19 To wit, that God was in Christ, reconciling the world unto himself , not imputing their trespasses unto them; and hath committed unto us the word of reconciliation. Who did God reconcile? “THE WORLD”. 1Tim 2:4 – 6 Who will have all men to be saved , and to come unto the knowledge of the truth. For there is one God, and one mediator between God and men, the man Christ Jesus; Who gave himself a ransom for all , to be testified in due time. What is God’s will? That “ALL MEN-BE SAVED”, “NOT WILLING THAT ANY SHOULD PERISH”. How will they be saved? By knowing the Truth. Who was Jesus ransomed for? “ALL”. Who is God the Savior of? “MAN[kind]”. 1Ti 4:9, 10 This is a faithful saying and worthy of all acceptation. For therefore we both labor and suffer reproach, because we trust in the living God, who is the Savior of all men, especially of those that believe. 1Jo 2:2 And he is the propitiation for our sins: and not for ours only, but also for the sins of the whole world . 1Jo 4:14 And we have seen and do testify that the Father sent the Son to be the Savior of the world . Heb 2:9 But we see Jesus, who was made a little lower than the angels for the suffering of death, crowned with glory and honor; that he by the grace of God should taste death for every man. Jesus tasted death for “EVERY man”, not just those predestined for salvation before time began. 2Co 5:14, 15 For the love of Christ constraineth us; because we thus judge, that if one died for all , then were all dead: And that he died for all , that they which live should not henceforth live unto themselves, but unto him which died for them, and rose again. Who did Jesus die for? “All”. Isa 45:22 Look unto me, and be ye saved, all the ends of the earth : for I am God, and there is none else. Who is God exhorting to be saved? “ALL THE ENDS OF THE EARTH”. The above is clear Scriptural proof that God intended to save all men during this age. He made the provision for it and did it Himself. However, man must accept the covenant (contract) to be saved. Thus, many will perish because they do not want to submit to God, which is required in the covenant (contract). If it was completely up to God, as Calvinism claims, then all men would be saved because the above Scriptures prove beyond all shadow of doubt that God’s will was to save all men. Who shall be saved? Only those He forces to believe on Him? NO, but “Whosoever” that shall call on the name of the Lord will be saved. Everyone has the freedom to call on Him and be saved. Rom 10:12, 13 For there is no difference between the Jew and the Greek: for the same Lord over all is rich unto all that call upon him . For whosoever shall call upon the name of the Lord shall be saved. Who is to repent? Only the chosen? NO, but all men everywhere are to repent. Calvinism would say that it is impossible for men predestined for Hell to repent but that would be calling God dim-witted for commanding men to do something that He knew they could not do. Mat 11:28 Come unto me, all ye that labor and are heavy laden , and I will give you rest. Who can lose his life for Jesus? “Whosoever will”, not whosoever God wills. Did God say to only preach to those predestined for salvation? NO, but those are the only people you could preach the Good News to for it to be true. If you preach the Gospel to anyone else, you would be lying. We are to preach the Gospel to “all the world” because all the world was elected to salvation but many will reject the Truth. Luk 9:23 And he said to them all, If any man will come after me , let him deny himself, and take up his cross daily, and follow me. Are only those God chose allowed to follow Jesus or are all? “Any man” can follow Jesus. As you can see, there are many Scriptures proving Calvinism’s Unconditional Election to be false. Calvinism only looks at the verses that agree with their theology. However, they refuse to look at these verses mentioned above and include them. That is just bad hermenuetics. A person reading the Bible would never come to Calvinistic conclusions on their own. They would have to be taught Calvinism by men to ever see it. 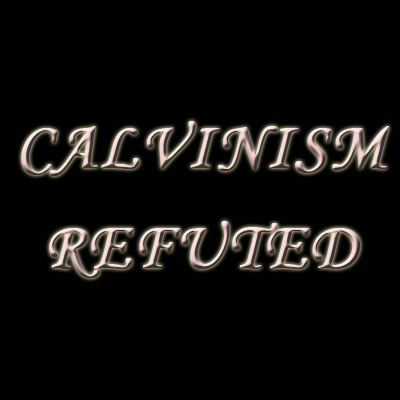 Calvinism is a teaching that denies parts of the Bible. It is a confused theology from beginning to end and needs to be discarded completely. It is time we started reading the entire Bible instead of relying on the theology of a man that had incomplete revelation coming out from under the Dark Ages. Calvinism added an assumption to the Bible that never was meant to be which is that man does not have a free-will. There is no Bible verse ever stating or even implying such a conclusion however there are thousands of examples of man using a free-will to make decisions. The tragedy is that God took away the sins of the whole world and the world does not even know it. If they do not know it, then they cannot have faith in Jesus to be saved. Therefore, the saying of Hosea 4:6 is true, “ My people are destroyed for lack of knowledge “. Sins are only remitted by faith in Jesus Christ (Eph 2:8; Mrk 16:16; John 3:36; Act 13:39; Rom 3:22- 26; Rom 4:5; Rom 10:9, 10; Gal 3:22) and how can one have faith if they do not know Him and what He did for them? So, as far as God is concerned, the whole world has been saved. As far as man is concerned, he has a choice to accept or reject the Savior to complete the transaction. Now it is up to the Church to preach the Gospel which draws men so that they can be reconciled to the Father. Let us examine the Scriptures Calvinism uses to prove its stance and view them in the light of the rest of the Bible. This verse simply says that we, the Church, were chosen or predestined before the foundation of the world to be holy and without blame before Him in love. We were the ones to be adopted as opposed to the others that will be in Heaven who were not adopted but were saints under another dispensation, for example the Old Testament saints. They were under a different plan and yet they will be with God in Heaven. These verses in no way imply that God only chose specific people of this age to be in the Church while others go to Hell. God chose all men to salvation and the Thessalonians that accepted the Gospel, being addressed here, were obviously of that group as opposed to other men of God’s creation that were not. 1Pe 1:2 Elect according to the foreknowledge of God the Father , through sanctification of the Spirit, unto obedience and sprinkling of the blood of Jesus Christ: Grace unto you, and peace, be multiplied. Peter is addressing the elect that have accepted the Gospel of Jesus Christ in this epistle. Again, this verse does not prove the Calvinism stance that specific people of this age were the elect. It does show, however, that God foreknew who the elect were, both the election of His perfect will, all mankind born in this age, and the election of His permissive will, those who obeyed the Gospel. Joh 13:18 I speak not of you all: I know whom I have chosen : but that the Scripture may be fulfilled, He that eateth bread with me hath lifted up his heel against me. When He said, ” I speak not of you all “, Jesus was saying that all of His twelve disciples did not consider Jesus their Lord and Master. Judas Iscariot was the exception. However, the next statement is what Calvinism uses to prove God destined some men for Heaven and others for Hell. But, ” I know whom I have chosen ” in no way proves election the way Calvinism sees it. Calvinism reads that to say, “I have chosen all but Judas for salvation.” But that is not true. It only means exactly what it said which is that Jesus knew who He had chosen. He understood exactly what He was doing when He chose the twelve including Judas . Jesus did choose Judas Iscariot for salvation but Judas made the free choice to reject God’s Way. We see here the pattern that I am trying to prove which is that God tried to save all men, including Judas, but some will reject the Gospel, which Judas did. God tried to save all mankind; there were never some that God predestined for Hell or the Lake of Fire . Judas was extended the same chance as the others at salvation . God extends the chance of salvation to ALL MEN in some form or fashion. Calvinism believes that man is so depraved that he cannot choose God. Because of this false premise, they step into another false idea: they believe we are born-again, and THEN we have faith as a gift of that salvation. This certainly is not true. Faith precedes salvation and is man’s part necessary for the completion of that transaction between God and man that we call salvation. As this author has already proven, man’s will does function to choose Christ and he does so once the Gospel is presented to him. However, let us examine the Scriptures they use to prove their stance. This is another verse Calvinism uses to say man has no part in his own salvation. It is correct that man has no part in his own salvation except to believe . Faith is the ONLY thing man can do and even that is a gift of God. Therefore, God gets all the glory for our salvation and we deserve none. Some Calvinists say: if we are using our faith to be saved, then we had a part in our salvation. That would be true if faith originated from us but it certainly does not. Faith is God’s gift (Rom 12:3; Eph 2:8). Faith comes when the Word is preached. Rom 10:14, 15 How then shall they call on him in whom they have not believed? and how shall they believe in him of whom they have not heard? and how shall they hear without a preacher? And how shall they preach, except they be sent? as it is written, How beautiful are the feet of them that preach the gospel of peace, and bring glad tidings of good things! Who sends the preacher? God. In this way, God draws all men unto Himself . People have got the idea that God draws men unto Himself in some mystical, magical, and invisible way. But this verse explains exactly how He draws men; it is through us – the Church of the Lord Jesus Christ preaching the Gospel. Man hears the Gospel but with his mind alone he cannot truly accept it. But with the Holy Spirit revealing the Truth to his spirit, man can make the decision to accept the Gospel and be saved. This verse is so clear that this author is amazed at people claiming God saves us first, and then we get faith only as a result of salvation. The grace is God’s part of the salvation experience. Faith is man’s part but even the faith comes from God as a gift. Notice it says ” through faith” we are saved. We MUST have faith to be saved; otherwise, no one has even been born-again. This verse completely annihilates Calvinism’s “salvation precedes faith” stance but they cannot see it because they choose (how ironic) to stick to their doctrines of Total Depravity and Unconditional Election. Easton , M.G.. Easton’s Bible Dictionary . Grand Rapids , MI : Christian Classics Ethereal Library, 1897. Strong, James. Strong’s Exhaustive Concordance of the Bible . Madison , NJ : World Bible Publishers, Inc., 1986.